So today we decided to get a little experimental in the kitchen and show you exactly why we LOVE spaghetti squash! Let's be honest when we sit down in front of bowl of spaghetti its pretty hard to eat just one serving. Italian food has that amazing comforting quality we all desire and there have been times when we have gone in for seconds. Yes, we are guilty of that. 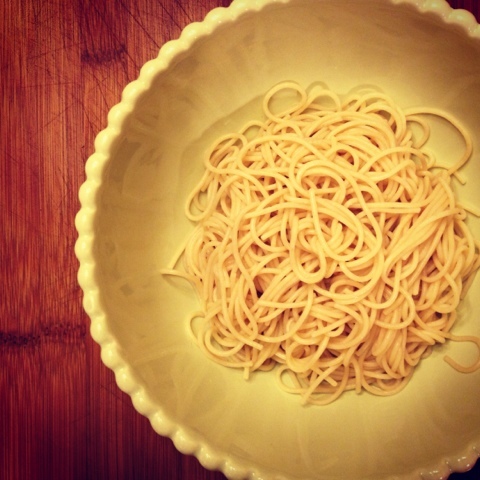 Well, one serving of whole wheat spaghetti has 210 calories and if you decide to go in for another bowl, you are looking at over 400 calories! This doesn't include sauce, meatballs, or CHEESE! As you can see calories can add up super quick! 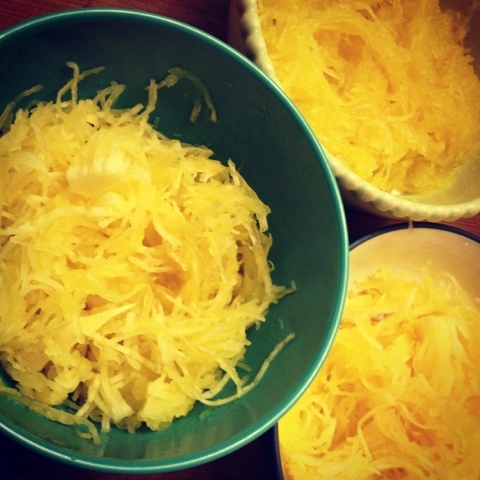 Where can you use over 5 cups of spaghetti squash? Well that's easy, a baked 'ziti'. You can make an entire baked spaghetti squash for 210 calories worth of 'pasta'. Yes, an entire baking dish full of spaghetti squash has the same amount of calories as a measly bowl of regular pasta. That's crazy! Now you can see why our love is so strong for the spaghetti squash. You can eat more of it and still save calories! Now go ahead and sit down in front of a BIG bowl of spaghetti squash tonight along with us! 1. Cut spaghetti squash lengthwise and scoop out the seeds. Add one half to a microwave safe dish and add one inch of water. Cook half on high for 15 minutes, and then repeating with the second half for another 15 minutes when finished. Use a fork to scrape the 'pasta' into strands. I LOVE spaghetti squash! I am gluten-free, so it is another great option aside from gluten-free pastas. Too funny! I saw spaghetti squash in redbook and was just searching for a recipe when I saw this! Does it really taste like spaghetti? I honestly have never even tried squash but I like the idea of eating like pasta with less cals. It's great, but doesn't taste like spaghetti. But it's the idea that you're saving so many calories. And once you top it with sauce it's great. I love it alone too, it has a sweet flavor.Ive also topped it with my basil and parsley pesto, it was the best! It doesn't taste like spaghetti, it's really more the shape of the meat that gives it the name. But, it is excellent at absorbing the flavor of whatever you cook it in, so it makes a great substitute in anything that you would normally use noodles for, including stir fry. But the best all time ever way to make it: 3 beaten eggs, 1 jar of spaghetti sauce, one pound grass fed hamburger meat, browned and drained, and the meat from one cooked spaghetti squash, mixed and baked in a casserole dish at 400 degrees for 1 hour. You. are. welcome. It does not taste like spaghetti, but it is surprisingly tasty with spaghetti sauce! have been meaning to try spaghetti squash for awhile, hoping to try one of these recipes soon! My husband prefers pasta to spaghetti squash, so, when we have bolognese sauce, I serve him regular pasta and then, on my plate, I have spaghetti squash with just a tad of pasta topped with a regular serving of bolognese sauce. It's delicious and healthy. That little bit of spaghetti pasta adds to the flavor. I love spaghetti squash! :) YUM! I never can cut them though so I wash it, microwave the whole squash uncut for 5 minutes, cut and then follow the instructions. Also, I love the new background! :) I've been blog MIA with school ending :) It looks great though!! Try it mixed with taco seasoning mix then use instead of chicken or beef in tacos. Just add chopped tomatoes or salsa, guacamole' lettuce...anything you would normally add to your taco! Use corn tortillas if you want it gluten free. That's a great idea for a vegetarian substitute! I tried a new way to cook spaghetti squash, I cut it in half width wise, scooped out the seeds and put it cut side down in a crock pot that had tomato sauce in it for 4 hrs. Next you scoop out the squash. It comes out easily. I had some turkey meatballs in the freezer, so I added them at the 2 hr mark. 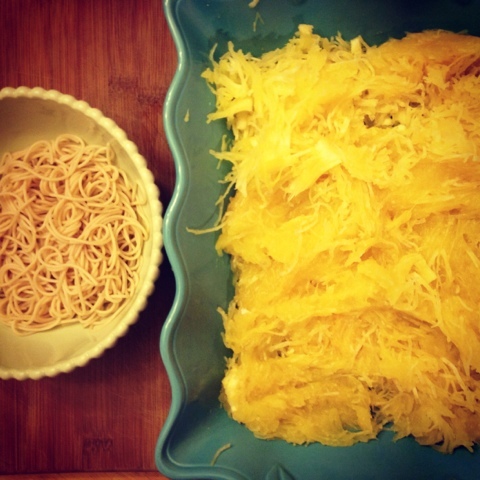 Spaghetti squash is not like spaghetti, but much better than those tofu noodles! Spaghetti Squash is the BEST for weight loss. Tastes like thin spaghetti. I have to say, it's worth baking for 40-50 minutes in the oven... much tastier than the microwave. Brush it with olive oil and crack black pepper all over it before putting it in. Lay the halves cut side down on a baking pan with tin foil on it. You can also grind some salt on it. Even if you still do the microwave, add freshly ground black pepper... amazing! I microwave it for 5 minutes( cut in half) ...15 minutes is way too long for most microwaves. A teaspoon of basil and garlic pedto tossed in after its been scraped out of skin. Delicious eating. I love spaghetti squash! But I bake (roast) mine instead of using the microwave. I just think it tastes better. You simply cut in half, scoop out seeds, lightly coat the inside halves with olive oil and a bit of salt and pepper. Place cut side down in a shallow pan and cook for approximately 40 minutes at 375 degrees (or until a fork pierces the skin side easily). Let cool a bit then shred into "spaghetti". Some folks add butter and Parmesan, but I think it already has a buttery flavor, so I skip that and just sprinkle a bit of Parmesan on top. Yum!!! And yes, the oven method takes longer, but you should give it a try. The taste is more complex and definitely better I think. I found it hard to cut pre-cooked. Saw another recipe on how to cook and have doing it this way all the time now. Put the whole squash in the oven on a cookie sheet, preheated oved 380 degrees, 55 minutes. No added oil or seasoning!! After it is cooked, you cut and gently scoop out seeds, then scrape with fork and you have your spaghetti!! Delicious and oh so simple. I microwave for 13 min, let cool, cut, gut and shred. I use spaghetti squash as a side dish with broiled salmon. It's to die for. Best Dish, i will always love spaghetti. Also Check Latest GBWhatsapp Mod application of Whatsapp.